The recent Chromatic Theology series has given me a slight tinge of color envy. Soak up this post and feed your jealous streak with a heaping dose of green. ﻿Each post in this series explores an individual hue, but the characteristics of the topic color can be translated into tints and shades. Keep in mind that the effects and emotions we discuss are most prominent and intense in pure, saturated color. To some extent, the distinctive attributes of green will be present in color variations - grass, avocado, chartreuse, apple, kelly, olive, etc. 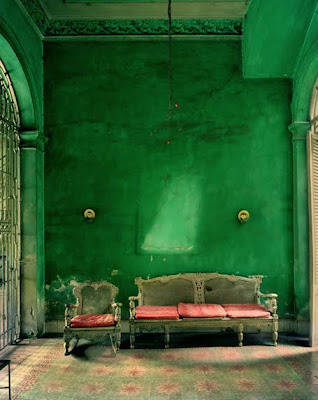 GREEN is a secondary color with harmonious emotional content. Green draws life from yellow, while blue lends a calming effect. One of the only unanimous forms of beauty is nature; green is the predominant color in nature - commonly regarded as the ideal color, carrying the positive charisma of all hues. Color schemes implementing green have been used extensively in offices, institutions, and public spaces, denoting the negative ‘institutional green’. Even in large doses of saturated color, green is rarely offensive. This hue is considered innately pleasurable, sharing calming and restful implications with nature. Come back next week for an optimistic and lively case of the blues.